Five persons were arrested Tuesday for their alleged roles in the mob violence and the cow slaughtering cases in Bulandshahr earlier this month that had claimed two lives including that of an on-duty inspector and a civilian, officials said. Three of them have been arrested by the Bulandshahr police for their involvement in the cow slaughtering case, while two accused were nabbed by the Uttar Pradesh Special Task Force (STF) for the subsequent violence on December 3, the officials said. “Three men Nadeem, Raees and Kaala have been arrested for their role in the cow slaughtering incident. A vehicle and a licensed weapon have also been recovered from their possession,” Bulandshahr Senior Superintendent of Police (SSP) Prabhakar Chaudhary said. He said the trio was not named in the initial FIR, which had seven accused including two minors of Nayabans village, but during the probe, their names emerged in the case. “The police are investigating the matter and these three men have emerged for their actual role in the cow slaughter. Further probe is on,” Chaudhary told PTI. Sachin Singh alias Cobra (21) and Johnny Chaudhary (19) were arrested Tuesday evening by the Noida unit of STF, which had also joined the probe in the adjoining district, for their role in the violence on December 3, a senior official said. “Working on a tip-off, the two men, whose identity had been ascertained post the violence, were picked up at 4. 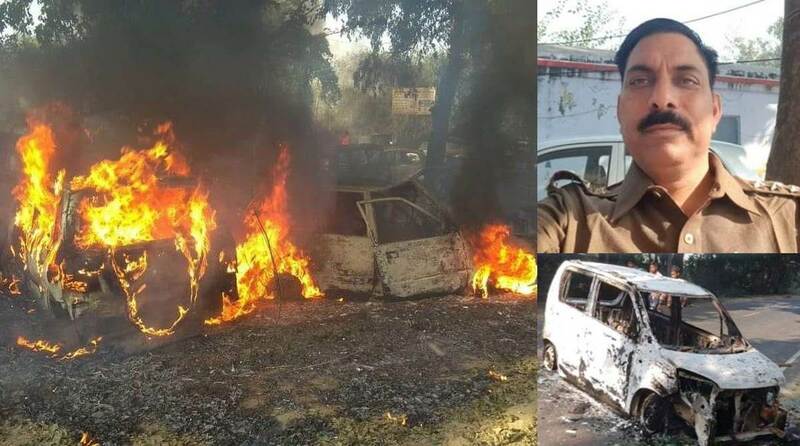 15 pm from a bus stand in Gathiya Badshahpur in Siyana tehsil of Bulandshahr,” Deputy Superintendent of Police, STF, Raj Kumar Mishra said. With the arrest of these two men, the number of the those held for the violence has gone up to 19 so far, SSP Chaudhary said. One of the main suspects among the 27 named in the FIR, local Bajrang Dal leader Yogesh Raj, is still absconding, while an Army jawan, Jitendra Malik, has been arrested and remanded in custody. A soldier allegedly involved in the Bulandshahr firing was also arrested by his unit in Jammu and Kashmir. Earlier this month, a top police officer and two other cops were transferred in connection with the violence. Acting on a report submitted by the Additional Director General of Police SB Shiradkar, Circle Officer (CO) Satya Prakash Sharma and Suresh Kumar, the in-charge of Chingravathi police chowki, have been transferred “for their failure in responding in time to the situation arising on Monday in that area”.